V-Ray Next Scene Intelligence delivers faster ray tracing, cleaner sampling and more accurate rendering. That means you work smarter — not harder — by automating steps that used to take up valuable time. Automatically analyzes your scene to optimize rendering — so you get the best quality in less time.. Faster, cleaner and more accurate image-based environment lighting. Up to 7x faster than before. Perfect renders are as easy as taking a snapshot with new Automatic Exposure & White Balance. Fast new GPU rendering architecture with support for more of your favorite high-end production features. Instantly remove noise while rendering. Based on AI-accelerated denoising technology by NVIDIA. Accurately measure the light levels in your scene using new lighting analysis tools. Render more realistic-looking hair with accurate highlights and melanin color controls. Apply several materials to the same object and select the one you want at render time. Load any texture or material that’s available in V-Ray Standalone and render it in V-Ray Next..
Denoise individual render elements for added control in compositing. Supports animation. Supports Alembic 1.7 and layers for efficient handling and updating of Alembic data. For V-Ray for 3ds Max Online License Options, click here. Render professional-quality, photorealistic images and animation with V-Ray’s adaptive ray tracing technology. Stop your render at any point and pick up where you left off. New algorithm that dramatically speeds up rendering in scenes with many lights. Simulate any type of natural, artificial, or image-based lighting. With a wide range of light types, including area lights, physical sun & sky and IES lights, you can render any lighting scenario. Real-world camera controls let you work like a photographer. Render images with detailed depth of field and cinematic motion blur. Experience your project in virtual reality. Create content for popular VR headsets with 6x1 cubic and spherical stereo camera types. General-purpose shader by Anders Langlands includes built-in SSS controls; popular for skin. Now with full support for GI, reflections and refractions for accurate light mixing in post. Automatically create ID mattes with support for transparency, depth of field, and motion blur. Review, analyze and post process your renders directly in V-Ray’s advanced frame buffer. You can be sure your images will match your final output. The upgrade to V-Ray Next for 3ds Max will allow customers to use either V-Ray Next for 3ds Max or V-Ray 3.0 for 3ds Max. 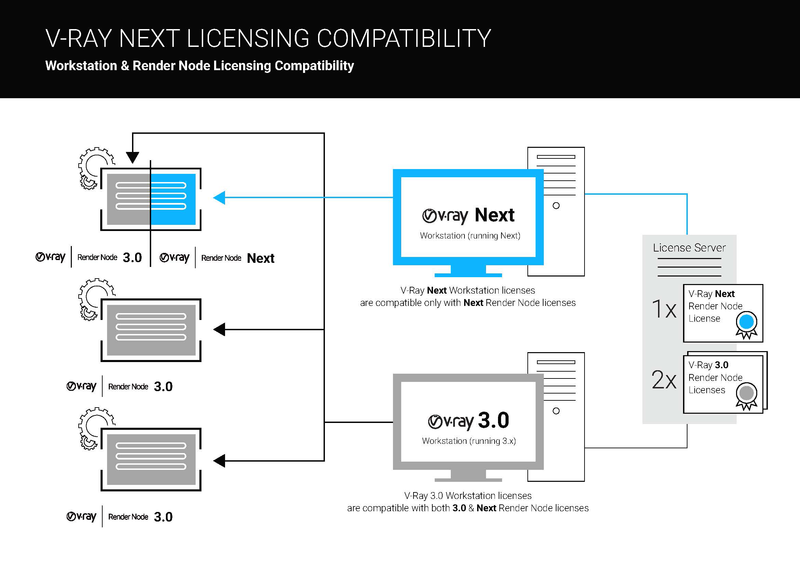 V-Ray 3 Workstation for 3ds Max licenses will work with V-Ray Next Render node licenses so clients who use V-Ray 3 for 3ds Max (or other platforms) can render with V-Ray Next Render node licenses. Toolfarm can only sell Chaos Group products to customers in North America (Canada, USA, Mexico). If you're outside of North America, please visit Chaos' website to purchase or find a reseller. Only IPv4 is supported. IPv6 is currently not supported. Note: for rush delivery please contact sales@toolfarm.com. VFB color corrections (incl. Background and LUT) can be saved with the final render as raw .vrimg or OpenEXR files. LUT strength can also be controlled. Paul Hatton takes a look at V-Ray’s render elements and how to composite them into After Effects. Hammer Chen shows you how to create a rusty metal shader with V-Ray 3.3 and 3DS Max. This tutorial, part of ” The Ultimate Introduction to V-Ray for 3ds Max ” course from Mograph Plus, shows you how to render realistic explosions and smoke in V-Ray for 3ds Max.